Several years ago, I bought an old Bible at a local auction in North Carolina. 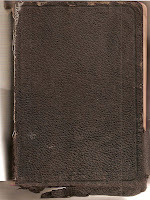 Although the copyright page is missing, it dates pre 1901. 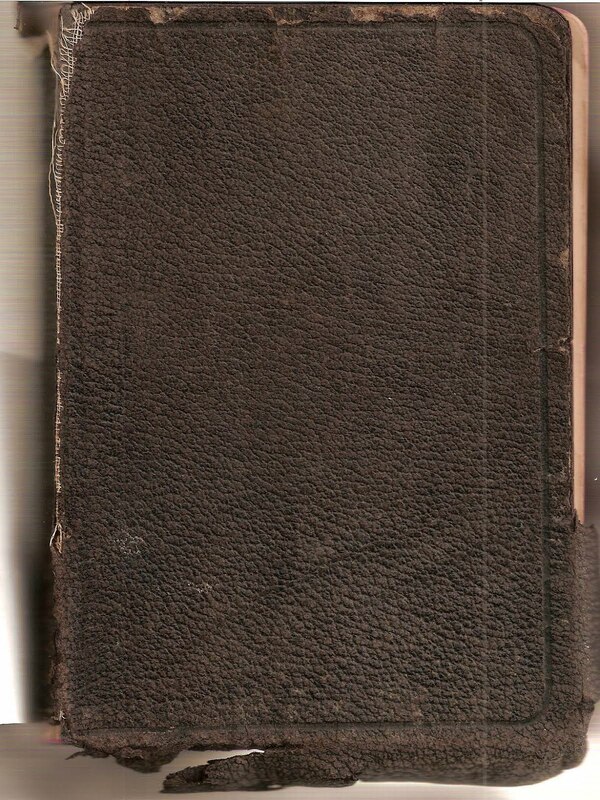 Inside is written in script, "Annie Catherine Shore from Aunt Lou, Oct. 9, 1901" and "Commit thy way into the Lord - trust in Him." 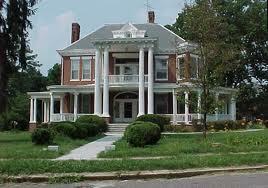 On the preceeding page, is written; "Sallie Ward Shore, Blackstone, VA July 25, 1904." The date is underlined twice. Through investigation I have uncovered that Annie was the older sister of Sallie. Inside the bible, there are no center pages for entering family genealogy information. There is however, scrapes of paper. One is a handwritten reference to "Bessemer, AL. 2216 - 11 Ave." The other is a receipt made out to Sallie W Shore June 22, 1915, from Farmville, VA, To State Summer Normal School of Virginia. For Board 15.00 and Registration 1.00, signed by J.L. Jarwan. There is also a pressed piece of fern between the bible pages, and a red candy wrapper for Apollo chocolates. There is also a small handwritten note of bible scriptures. On the Bible's last back page is written again, "Sallie Ward Shore, July 25, 1904." My earlier post in 2001 on the Shore Message Board, brought a response from Robert L. Shore. Though he indicates he does not descend from Sallie Ward Shore, she does appear in his family line. According to his email, it was thought her father's name was "Valley" Shore, though he had some doubts about the accuracy of the first name at that time. It was known though, that he was the son of Dr Henry "Edwin" Shore of Nottoway County, who in turn was the brother of Mr Shore's third great grandfather, Thomas Shore of Petersburg. These two in turn, were descended from Dr John Shore Jr of Petersburg and later of Nottoway County. Dr Robert Shore's first wife was a Ward, so he suspects that Sallie Ward Shore was part of that family. 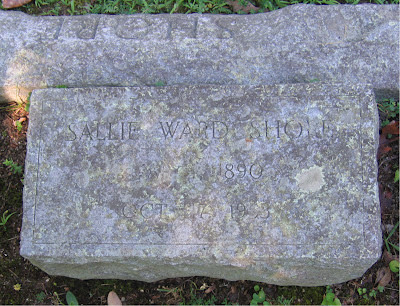 My further search, brought me to Find a Grave which reveals that Sallie Ward Shore, was born March 1890, and died October 17, 1953. She is buried in the Lakeview Cemetery in Blackstone, Nottoway County, Virginia. If these dates are correct, that would make Sallie eleven years old when Aunt Lou gave the Bible to her older sister Annie. Sallie's father was Valentine Shore, born Feb 14.1855, died July 28, 1938. He was the son of H.E. 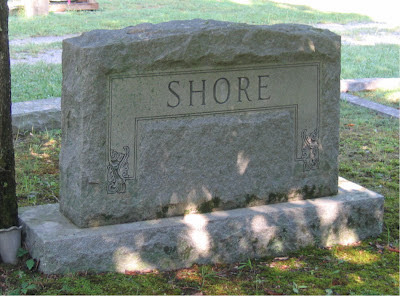 Shore and Ann C. Epes. He married Miss Sallie E.E. Ward on Nov. 21, 1877 in Nottoway County, Virginia. Sallie was born 22 Feb. 1857, died April 28, 1939. She was the daughter of Robert Ward and Louise F. Shore. The Ward family were one of the founding families of Nottoway County. Known children of Valentine Shore and Sallie E.E. Ward, and listed at Find a Grave, are also buried in the Lakeview Cemetery in Blackstone. Those include; Annie Catherine Shore, Robert Fitzgerald Shore, Sallie Ward Shore, Elizabeth Rebecca Shore and Lelia Valentine Shore. Are you related to Sallie Ward Shore, her parents or siblings ? Perhaps you know someone who is related to this family. My goal has always been to return this old tattered Bible to family members. This search for Sallie and her family reminds me how important it is to not lose touch of those special people that have preceeded us. You may contact me at gayleh@brmemc.net . I look forward to your reply.